Tired of getting junk emails and think that your customers are tired of them too? Often, our own bad experiences with email marketing convince us that it doesn’t work. But research proves that email marketing is actually the second-biggest sales trigger in ecommerce, outperforming both Twitter and Facebook when it comes to sales. The only thing more powerful than email marketing is search engine traffic! So, once you’ve learned the basics of SEO, it’s time to focus on your email marketing campaigns to increase sales and build strong relationships with your customers. Email marketing can be a way to keep in touch with old customers, reminding them why they bought from your store in the first place and keeping them up to date with what’s happening with your business. It’s also a way to reward loyal customers by offering them discounts, or incentivise customers who haven’t been back in a while to stop by your online boutique. The format of an email also gives you more room to get your message out there and say things that just won’t fit into a 140 character tweet. But what’s the best way to go about starting an email campaign, and what are some of the best practices of email marketing? It’s a daunting task, so we’ve compiled 21 quick and easy tips that will help you fine tune your campaign and boost your sales through email marketing. While it may seem tempting to make subscribing to your mailing list mandatory at checkout, this can seem too pushy and stop you from being able to build a relationship with your customer before it even begins. This goes hand in hand with the first tip, and it’s hugely important. 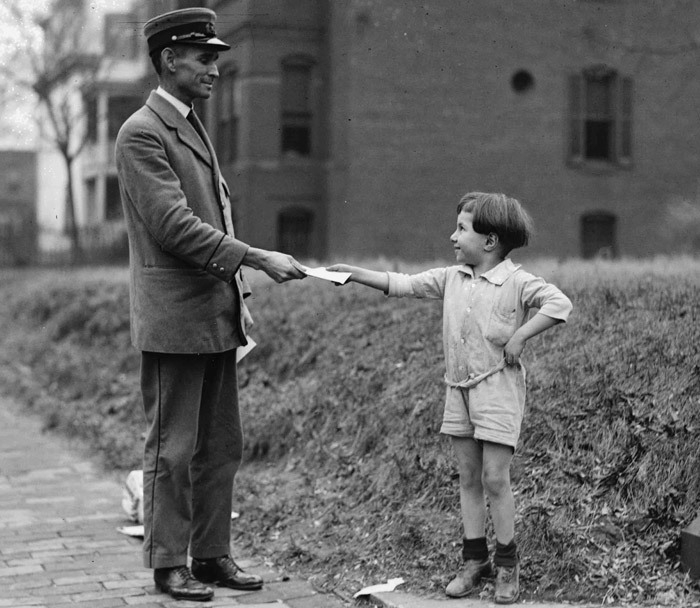 Users feel safer when they see the option to unsubscribe at the bottom of every newsletter you send out, because they know that they can opt out at any time and that you will respect their wishes. You may lose subscribers over the short-term, but over the long-term it’s a best practice that builds confidence in your brand. Whenever possible, address your email recipients by their first name. If you don’t have this information, keeping the email general with a familiar tone is your best route. Similar to personalising your emails, shoppers respond well to to discounts that are sent to them ahead of personal events like birthdays and wedding anniversaries. Of course, you can also try sending timed discounts for all the big shopping holidays, like Mother’s Day and Christmas. Black Friday and Boxing Day sales emails tend to be well-received because people are anticipating sales and actively searching for what’s on offer. 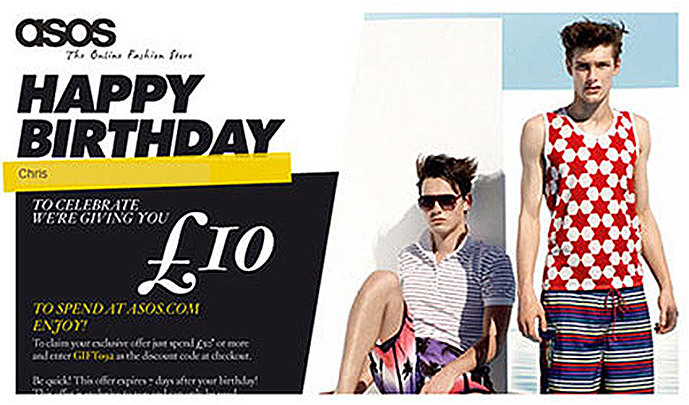 Example by online fashion store ASOS using birthdays as an innovative way to get customer back to their store. This works as people enjoy being rewarded for their loyalty and makes them believe there are benefits to repeat purchases. Whether it’s a notification that a sale is starting, sneak peeks to future merchandise or coupon codes, these all lead to customers wanting to return to your eCommerce store. Don’t get stuck crafting your Valentine’s Day newsletter on February 13th. Looking at a 12-month calendar and planning in advance which holidays you will target will save you time, effort and stress. Featuring your newest collection in an email, and offering the opportunity for pre-orders, is a way to make loyal customers feel rewarded while also making life easier for you on the business end. Your newsletter is a great chance to show your customers what it’s really like behind all the glitz and glamour of your beautiful online storefront. It’s also a great way to engage with your customers without having a sales focus, which helps strengthen your relationships. You can collect email addresses at checkout and on your About Us page (since customers have already shown an interest in learning more about you). But you should also have a prominent email sign-up bar on your online store’s landing page so that your email list, and therefore your email reach, grows as much as possible. Entice your customers to sign up by offering exclusive updates and awesome deals. Example by online fashion store Nasty gal hit the nail on the head with this 'Join the Party' sign up form. How can you resist! Testimonials give people the confidence to click ‘buy’ on your website, but they’re harder to get than you might think. Having an automated email sent out to your customers a few days after their order is a great way to gather testimonials. If no one takes the bait, you can add an incentive such as a prize drawing or a small discount on their next purchase. However, a personalised automated email asking people for their feedback on their specific purchases, with the promise that you’re listening and will share their reviews whether they’re good or bad, will often do the trick. A/B testing is using multiple versions (Version A vs. Version B) of the same email, with tweaks to the subject line or email body. See which one does better. What kind of subject lines do people open more: subjects highlighting sales or new products? Do your customers respond best when you put their first name in the subject, or does this put them off? You likely won’t be able to A/B test every single email you send out, so think about which emails are most likely to affect your bottom line and test those. Emails for big holiday sales campaigns should also have A/B testing priority, as well as newsletters around the holidays. Maintaining contact with your customers through email can be daunting, so one good rule of thumb is to commit to sending out one newsletter a month. Once you’ve started, you can increase your frequency to whatever feels right for your business. Just don’t forget to track what percentage of people are opening your emails and clicking through to get to your store -- that’s valuable information makes each batch of emails you send contribute to improving your overall email marketing strategy! Like most things in life, ecommerce sales usually follow the 80/20 rule when it comes to who drives revenue. Usually a large part of your overall revenue will come from a small number of clients, and those are the ones that you want to reward because they’re already more likely to engage with your emails, redeem your coupons, and repeat business. Some experts recommend dividing your customers into 5 tiers according to their ‘loyalty’, and target these tiers according to their level of engagement with your brand. You may not even have enough customers to separate them into 5 tiers, but pay attention to who buys the most from you and send them email incentives. Set up automated emails to be sent out to customers that haven’t visited your store in 6 or 12 months. These “we’ve missed you” emails should offer an incentive to click through to your online store, such as a discount, but often it just takes a gentle reminder of who your brand is and what they can get from you to pull a dormant customer back into the fold. 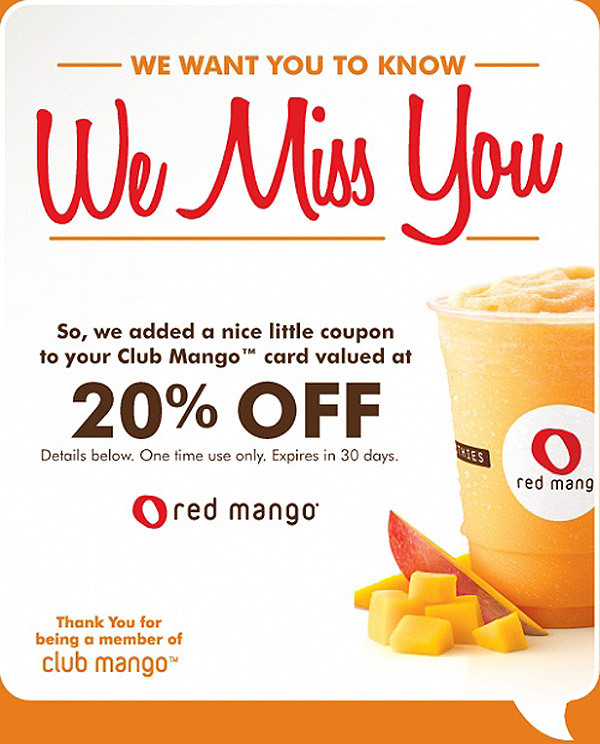 Example by Red Mango offering 20% to customers haven't been back in a while. Shoppers are more likely to come back if they have a reason, and saving money is a good reason. Offering an incentive is a strong way to show you care. The incentive doesn`t have to be a discount; it can be free shipping, a free white paper or a small gift with a purchase. Automated emails such as order confirmations and shipping notifications are expected, and opened more often than emails with an obvious sales focus. Use this opportunity to cross-promote your other products with a “related products” recommendation section. You should also add links to your social media accounts in these emails, as they don’t directly impact the sale but will help your business overall. Not every small business can afford to pay for advertising, and if you can’t, don’t worry. However, if you are paying for advertising, make your emails and advertising related. A recent study from a US retailer tracked users who saw marketing emails and their related facebook ads. People who saw the coordinated Facebook ads as well as emails were 22% more likely to make a purchase than the people who just saw an email. This is a hugely compelling reason to think ‘outside of the inbox’ and ensure that all of your marketing efforts work together. Or, in other words, build in lots of opportunities to get people to do what you want. This can be something as small as ‘follow me on Twitter’ or as big as ‘Become a lifetime member!’ One great tip is to give people something of value in the email, as they’ll want to click it and get used to receiving useful, clickable links in your emails. You can put out a link to your free e-book or other free online content, videos that you think would be engaging -- anything that gets them actively opening and clicking through! Remember, email allows you to attach files, so it’s the ideal way to share downloadable files with your customers. Most people are willing to recommend a product to others, but few people actually do, so it’s important to make it as easy as possible for your customers to tell others about your brand. Once they do, growing sales is easy, because people trust referrals from someone they know over advertisements virtually every time. Ever gotten an email from Uber? Even their transactional emails offer a referral code at the bottom, and offers an incentive for you to give the code to someone else and recommend their product. Users who do use referral codes get discounts or incentives and their friend who just became a new customer does so as well -- who wouldn’t want to participate? Your instincts already tell you that this is true, but it’s backed up by tons of research. If you want people to click on something, make it into a button. Simple as that. This may sound unconventional, but it’s actually a very interesting play on human psychology. People want to avoid losing out at all costs, so try sending out an email to your loyal customers that says they have £5.50 in FREE store credit to spend in the next 24 hours. Instead of a nebulous 10 or 20 percent off -- which often do not entice customers, as they like to hear big percentages -- your customers know exactly how much free money they’re losing out on by not acting quickly. Increasing urgency is also an excellent psychological motivator to increase sales. Don’t assume that because someone has been on your email list for months that they know who you are and what you do. Remember our post on describing your business in 140 characters That bite-sized description should go out with every email you send, with a clickable link to read more about who you are. It’s simple, but a sincere thank you makes everyone feel good and helps you connect emotionally with your customers. If you’re grateful for all of your email subscribers, let them know. You don’t have to send out an entire email dedicated to thanking them, but let your gratitude shine by welcoming them. It’s also useful to send out a thank you to your customers after you’ve reached a milestone to include them in your successes. 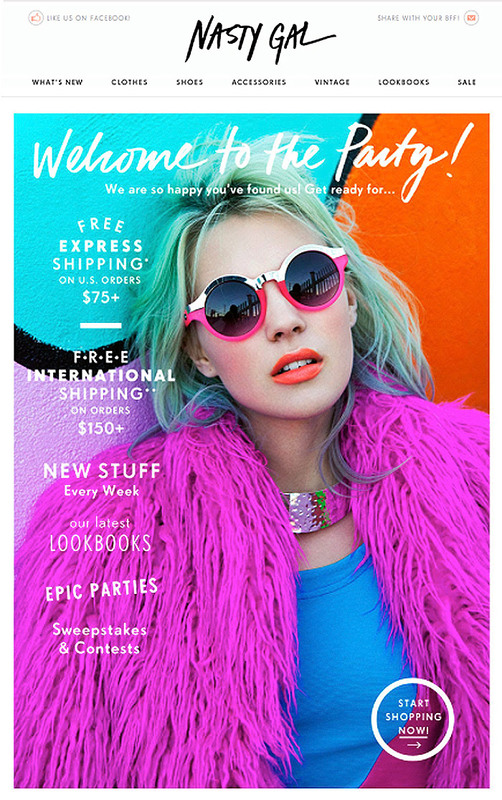 Once again, Nasty Gal have nailed email marketing with their, “Welcome to the party! We are so pleased you've found us!" email. Notice the inclusion of great perks like free shipping and new stuff! There’s no right or wrong way to welcome new guests, just make sure it’s conversational and fits your company’s voice. These 21 tips barely scratch the surface of what you can do with email marketing, but each one is a quick way to make sure your efforts at email marketing are targeted and effective. Not every tip will apply to you, but implementing the ones that do will help boost revenue and give you the push in sales you’ve been looking for!